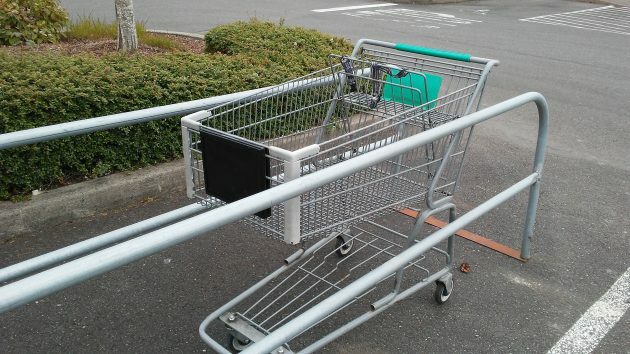 An abandoned cart sits on the parking lot of the North Albany Village center on May 1. “Do you know if the market is going forward?” a reader asked Saturday, referring to the planned supermarket at North Albany Village. And the short answer is yes, it is. It’s taking longer than expected, apparently. I asked my longtime contact at the Deacon Corp. how things stood. Deacon is in charge of developing the North Albany center for the New York entity that owns it. 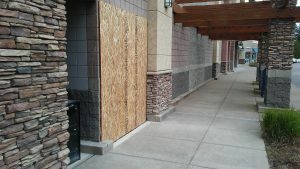 One of two new door openings for the building, as it looked on May 1. For a few weeks now, plumbers, electricians and concrete workers have been working at the site, I was told, but almost all the work has been indoors. A few days ago I saw a crew cleaning the wooden trellis outside the building. Also, there has been some caulking of doors and windows. The next thing will be restriping the parking lot, I understand, but that is waiting for the next round of good weather. Good on ’em! Eagerly awaiting. As one who likely will shop there almost daily, I find waiting excruciating. Maybe the new store will be at least as nice as Roth’s IGA from many years ago. I love Roth’s. There are still several in the Salem area. I wish that the store in North Albany was going to be a Roth’s, but I am just happy that it is going to be IGA, and am looking forward to shopping there. Also we will finally have a real hardware store in town without having to go to one of the two big evil boxes. If you’d like good local hardware, try MacDonalds on First St just west of the infamous train tressel. I have never been there, I will have to check them out. Thanks. They aren’t a complete hardware yet, but they seem to be trying.